I laughed. The subject of this 90/90 is not a wall flower, nor is he just an average Joe. He’s a man who hired me, formed me professionally, transformed a sleepy organization into a thoughtful instrument of the church, and buried my father. He’s a man who can’t think small, and no doubt thinks through everything. Most importantly, he’s a good and kind priest who understands that to understand the other, one must place him or herself in that person’s shoes — and listen. Reared in the Bronx, son of an Irish Catholic mother and a Jewish father, Bob Stern wanted to be a physicist, and he enrolled in Amherst College to do just that. But, he could not ignore a gnawing call to serve the Lord and his church as a priest. Eventually, he entered St. Joseph Seminary in Dunwoodie, N.Y., studied canon law in Rome and assisted as a young priest during Vatican II. It was there, as the fathers of the council sought to take on the challenges of the world by engaging in dialogue with it, that the young priest internalized this renewal of the church known as aggiornamento, and made it his own. It is a process he has instituted in all of his services to the church, from his 25-plus years in parish and community renewal in the African-American and Hispanic apostolates to his 26 years in leadership of CNEWA. For Msgr. Stern, this call for aggiornamento is a process not just for the sake of process, but one to help the church open the way to the Lord. “We take for granted freedom of religion and respect for conscience,” he wrote in CNEWA’s magazine in September 1990, soon after visiting the U.S.S.R. “Pluralism is our way of life.” He continued: “We speak...of the servant church that is a sacrament or sign of intimate union with God and of the unity of the whole human family. “When we ask the Catholic churches of the Soviet Union what help they need, we may be thinking of the buildings, equipment and tools we’re used to; they may be more concerned for vestments, prayer books and rosaries. Our pastoral goal may be how best to support all believers, Catholic, Orthodox and Protestant; theirs may be the repossession of their confiscated churches and the defense of their rights. “The challenge of their future is aggiornamento, to be caught up in the great renewal of the church launched by the Vatican Council,” he concluded. Thank you Msgr. Stern for your service to the church and the world, especially in waking us up to see all that unites rather than what divides us. As I write, our CNEWA team is headed home from Anaheim, after three whirlwind days at the legendary Los Angeles Religious Education Congress — the largest annual gathering of Catholics in the United States. An estimated 40,000 people attend this extravaganza every year. For the first time, CNEWA was invited to appear as an exhibitor, hosting a booth — along with some 250 other organizations — in the massive exhibit hall in the Anaheim Convention Center. It was a wonderful opportunity for us to catch up with old friends and make some new ones. There was great interest in our work among persecuted minorities in Iraq — and a lot of people who stopped by our booth took home small pins depicting “ن” (the Arabic letter “N”), recalling the way ISIS branded the homes of Christians for persecution. It was a rewarding weekend in so many ways, and I know Father Elias, Debora Stonitsch and I all look forward to making a return visit next year. If you couldn’t make it to Anaheim, we’d be happy to visit your corner of the country to share our story at your parish or diocesan event. Just drop a line to our development director Norma Intriago: nintriago@cnewa.org. A Coptic Orthodox priest comforts a Christian woman who has taken refuge at the Evangelical church in the Suez city of Ismailiya on 25 February. Hundreds of Coptic Christians have fled Egypt’s Sinai Peninsula after a string of jihadist attacks killed Christians in the restive province, church officials said. 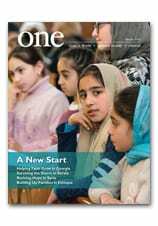 To learn more about Egypt’s Christians and Muslims finding common ground, visit the current edition of CNEWA’s ONE magazine. CNEWA is participating in the Los Angeles Religious Education Congress in Anaheim, California — billed as the largest gathering of Catholics in North America. Join our external affairs officer, Rev. Elias D. Mallon, S.A., Ph.D., development associate Debora Stonitsch, and me today through Sunday at booth #780. In this image from 2015, people pray March 15 during the Los Angeles Religious Education Congress. CNEWA will be participating in the congress this weekend, for the first time. This weekend, CNEWA heads west: for the first time. We’ll be hosting a booth at the Los Angeles Religious Education Congress in Anaheim, California — billed as the largest gathering of Roman Catholics in the United States. While most of the attendees are from California and the western U.S., the annual event attracts an estimated 40,000 people from as far away as the United Kingdom and Australia. The congress features speakers, liturgies, workshops and over 200 exhibitors — including this year, CNEWA. Among other things, it’s a great opportunity to just get out and meet folks — and help introduce people to CNEWA and our work around the world. We will be at the congress from Friday through Sunday, at booth #780. I’ll be there, along with our development associate Debora Stonitsch and our external affairs officer, Rev. Elias D. Mallon, S.A., Ph.D.